We headed out early this morning to pick up the floor sander at Lowe's (they don't take reservations, and today was meant to be the day). 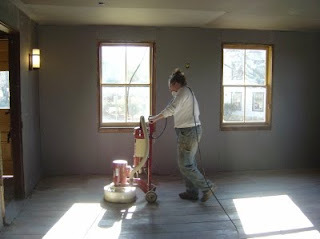 The sander is clearly made for even floors without protrusions, which is not what you normally find in an old house like Gunk Haus. The consequence was that the sand paper disks would get stuck on nail heads and floor board edges, and get shredded to pieces. By noon we had already returned the sander after E! had gone over the entire floor once. We never had the goal to get a squeaky clean floor, but take off (mostly) the paint on the floor, and to smoothen the ridges. It turned out pretty good, although E! spent a good amount of time on her knees with the palm sander doing touch up sanding. E! is a hard worker, and deserves all the credit you can lavish her with. long time ago I`ve watched your blog and progress in your Gunkhaus project. Because I have actually a coldness, staying at home, kids are out of our home and though it's a bit boring around me, I use the time refreshing my little English knowledges in reading your Gunkhaus blog. Respect! Always still hard work! You make a really good job! And when I look to myself: I`m really lazy in comparison to you. So have fun with my runaway English Gesuelze and E!, really sorry about that: we forgot Your birthday, or let me say, we were too lazy to send You birthday greetings. This is really bad! I try it next year to be on time! So, so, so sorry! Looking good, neighbors!! A few nights ago, Cameron said, "I can't wait for the Gunk Haus to open." His reply when asked why. "Because it's so close and we can walk home if you have too much beer." Looking good! I can't wait to sand our floors now. Feels like the final touch on something we've spent a lot of time on. We're heading up tonight and are anxious to see how many windows are in place. See you around!